They are business executives. Political movers and shakers. Sports icons. Media moguls. They're the most prominent women who are redefining womanhood in 21st-century America. From Sarah Palin to Oprah Winfrey to Kathy Ireland to Suzy Welch to Ivanka Trump, these women share several traits: They're smart, independent, successful, and they're shaping feminism today — even if it means being a mom and raising kids! Newsmax magazine's special report "Sarah Palin and the Leaders of the Newer Feminism" profiles 21 strong women living on their own terms and setting the standard for today's female. In Newsmax's special report, writer S.E. Cupp says that the days of bra-burning, feminist militancy from acolytes of Betty Friedan and Gloria Steinem who defined womanhood as simply anti-male, are gone. Today, women as different as Sarah Palin and Hillary Clinton can claim the feminist mantle. 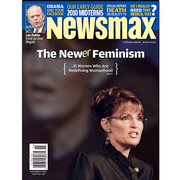 Why this is "the greatest time in history to be a woman"
Again, there is so much more in Newsmax magazine, which won a Gold Eddie Award in the News/Commentary category of Folio magazine’s prestigious journalism awards, the Eddies.